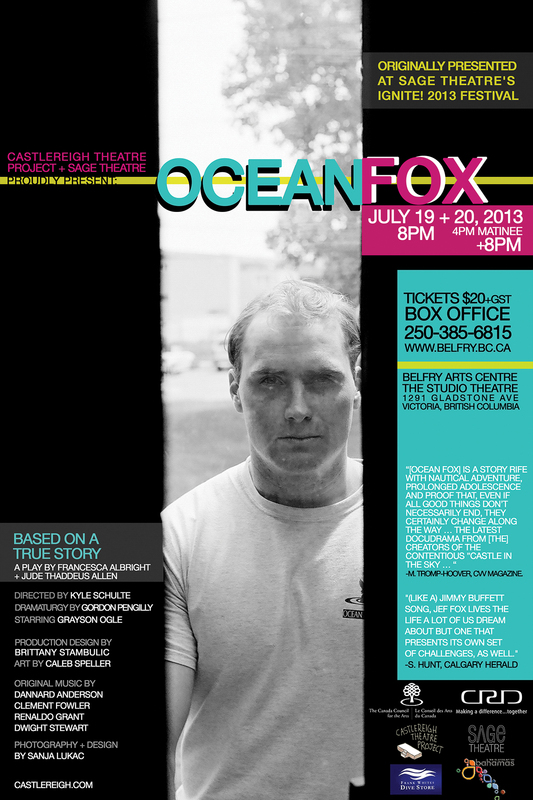 Castlereigh Theatre Project returns to Victoria (Belfry Theatre, Studio A) July 19th and 20th with Ocean Fox, a work they workshopped here in 2012. Castlereigh Theatre Project (helmed by the brother-sister playwriting team of Jude Allen and Francesca Albright) is an emerging theatre company based in Victoria BC, dedicated to the research, creation and production of new documentary theatre: fact-based plays built on real-life accounts and storytelling that explore and investigate current and universal themes. Allen and Albright originally met Fox while on vacation in the Bahamas on the remote Harbour Island. He seemed to have the perfect life – for over 30 years he’d done exactly what he wanted, surrounded by the sea and miles and miles of pink sand beaches. The duo were captivated by his stories – they’d found their next subject. Originally hesitant, Fox later gave permission for his life to be examined and dissected, the storyline teased out. “It’s the story of a man who inexplicably refused to change; he’d achieved his concept of what paradise was”, says playwright Jude Allen. “All things evolve and he didn’t”. Allen and Albright’s roots were not originally in the theatre but they have attracted some significant collaborators to their projects over the years. They met their dramaturge, Gordon Pengilly, award-winning playwright, at an Alberta Playwright’s Network workshop in Calgary. Castlereigh Theatre Project was formed in 2007 with the initial purpose of writing the controversial piece, Castle in the Sky. “In order to get things done, we had to do them ourselves”, claims Allen. Based on the tragic 2006 murders in Medicine Hat Alberta of three family members by their 12 year old daughter and her much older boyfriend, it examines incidents around the event, and the aftermath as the community tries to heal. I had the opportunity to see Ocean Fox in Victoria last year, and sat beside Fox’s sister who was visibly moved by the portrayal of her brother. Allen and Albright’s work demonstrates a deep desire to push the boundaries of what many have come to consider the theatre-going experience to be. Theatre-goers who want to explore with them will be fascinated by one man’s tale and a window into a life most of us can only dream about. I will add in some observations from the director Kyle Schulte, and the actor, Grayson Ogle, shortly. I have been offered a complimentary ticket to attend Ocean Fox for the purpose of writing a review. As always, I retain full editorial control over all content posted on my blog.